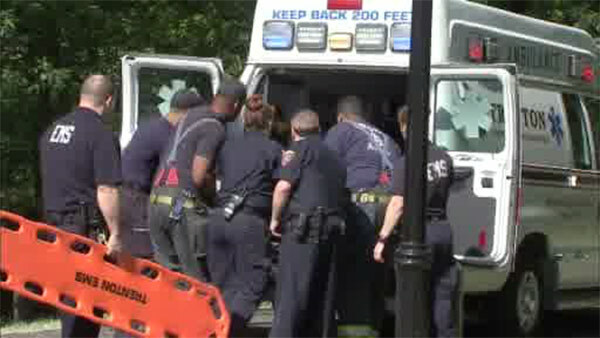 TRENTON, N.J. (WPVI) -- A man in distress was rescued from the Assunpink Creek in Trenton, New Jersey Friday Afternoon. It happened around 4 p.m. at South Broad Street near Mill Hill Park. A man and his mother were walking down the street when they heard cries for help coming from the creek. The son sprang into action, and jumped into the water to help. He managed to lift the victim, keeping his head above water until rescue crews arrived. The crews then hoisted the man out of the steep incline along the banks of the creek. It's not clear how the victim ended up in the water. There is no word on his condition. The Good Samaritan who helped the man said he appeared to be in and out of consciousness.